You know, I’ve always been envious of those amazingly clever people who can write poetry. It has such a magical feeling about it, enticing us in with it’s soothingly magical flow. It’s something I’ve tried my hand at over the years but never really been capable of perfecting, albeit that one time when I was about 10 years old and had something a bit silly published in a local poetry for schools book! Yay! But to me, any type of storytelling is enchanting and therefore just perfect for children. For their learning, for their free thinking and for their little imaginations. 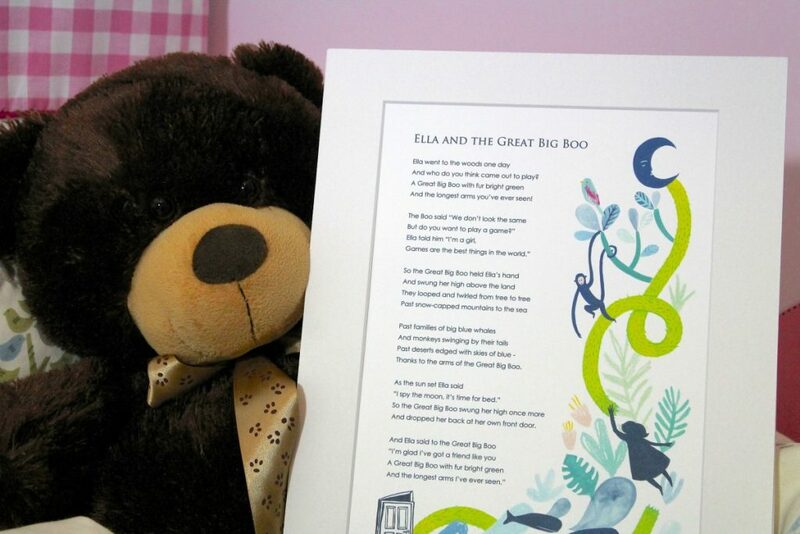 So it goes without saying that a magical gift of poetry is a most treasured gift indeed, which is why, when I was contacted by Bespoke Verse asking if I would like to review a couple of their beautiful personalised verses for Holly and Ella, I absolutely jumped at the chance. Ella particularly is a huge fan of listening to stories, and all things ‘story-telling’. She cannot read yet obviously, and can’t really talk that well to be honest either, but she will quite happily sit and read aloud her books to her audience of teddies, for what seems like hours. And with Holly now learning to read in her first year of big school, bringing home new books on a daily basis, reading such fun and fabulous tales along with her is just perfect and every parents dream. 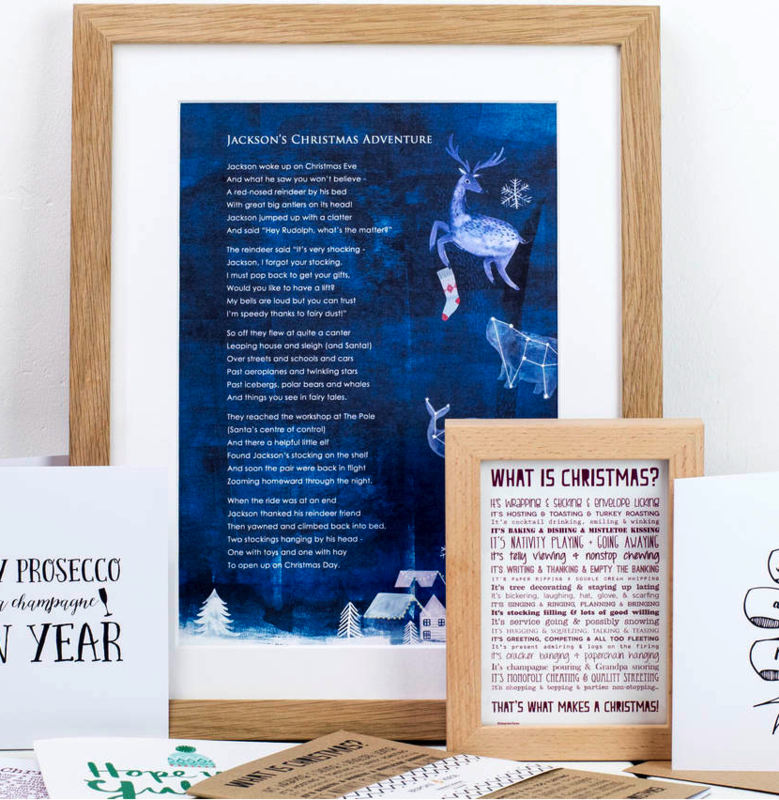 The wonderful prints from Bespoke verse were therefore a perfect pre-Christmas gift for the both of them. Their little eyes grew wide open in awe as I read each of the poems to them, and they listened with even more enthusiasm at the knowledge they themselves were the main stars of the tales. And with the beautiful steady, yet brilliantly fun rhyming flow of each verse, it made it so much more amusing for them to listen along to. Bespoke Verse is truly beautiful through and through. 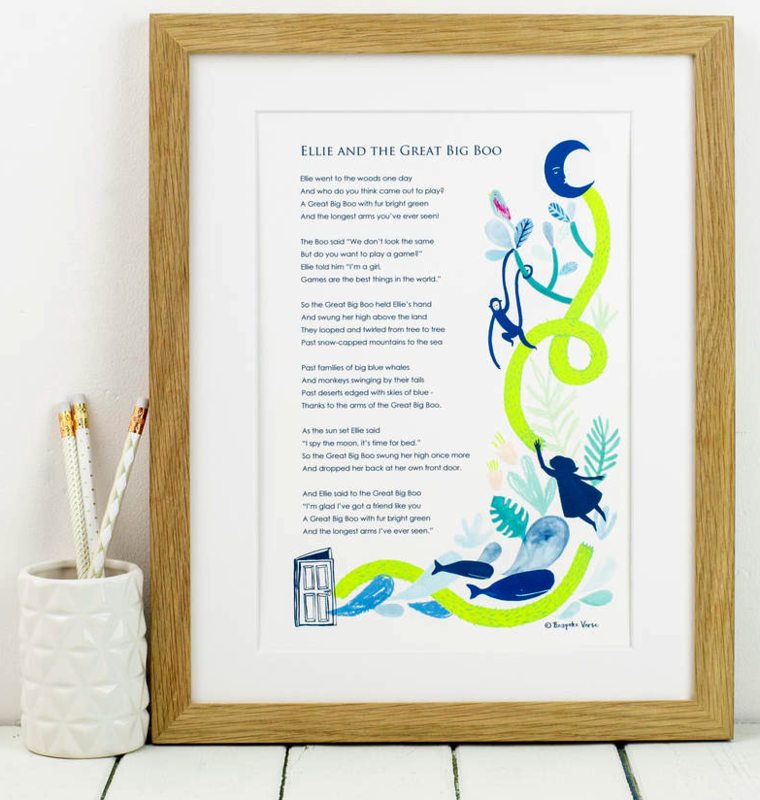 From its splendidly clever and delightful poetry, to their very own story of how the business started out in the first place, where owner, Joanna Miller grew a business from one off bespoke commissions following a poem she read out to her new husband on their very own wedding day. Joanna has grown the business further since then and now has five very talented writers who also work for her, a truly talented team of mums who juggle their outstanding writing talents with their busy home lives. 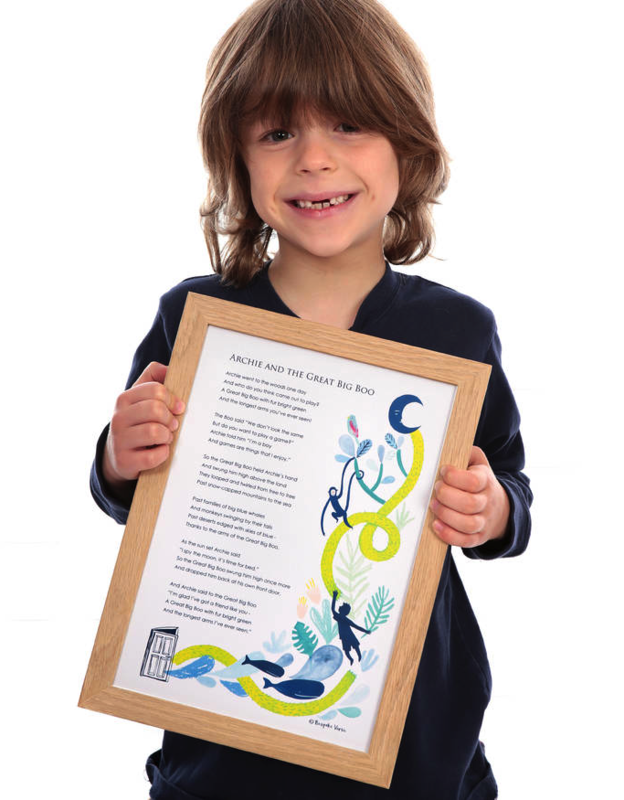 Bespoke Verse doesn’t just produce children’s poetry either. Oh no. 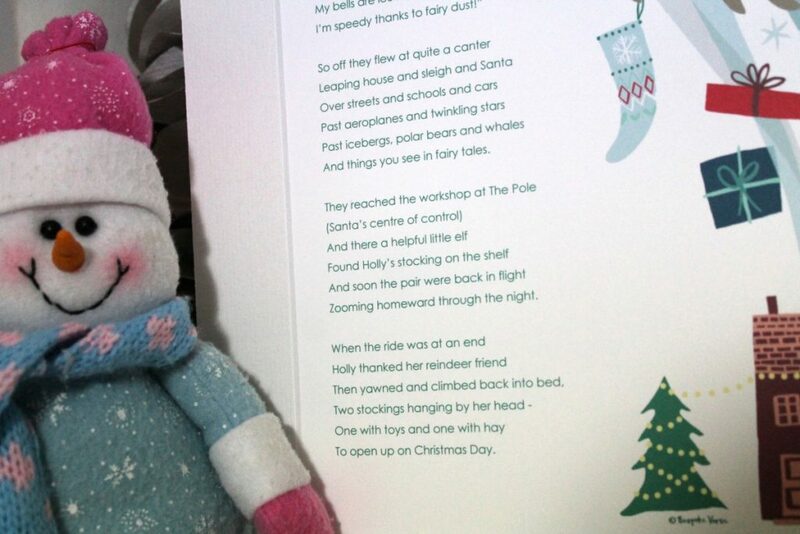 The product range is vast to include witty poetry and verse for all manner of occasions. But as a gift to a child, these personalised prints are just fabulous. This story took my little Ella on a journey bursting in make believe and fantastical imagination. Alongside her new found friend, the Great Big Boo, Ella had the most magical journey over land and sea, before it was time was bed. It’s a lovely little poem which also tells of how although they both look so unalike, they can still become the best of friends. 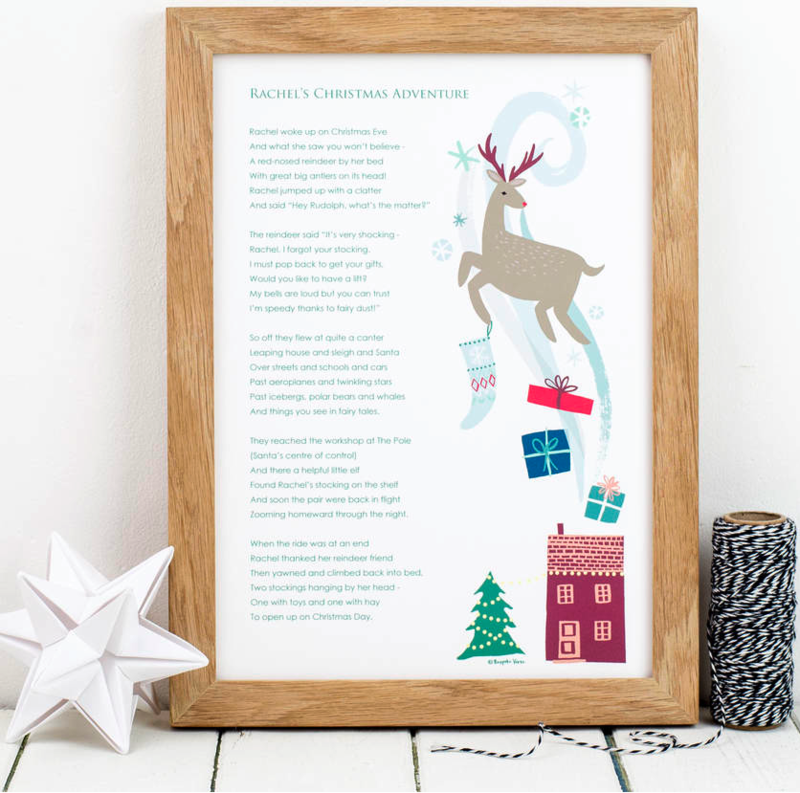 This little tale took Holly on a dazzling white wintry journey alongside the beloved Rudolph all the way to the North Pole to find her stocking which unfortunately had been left behind. 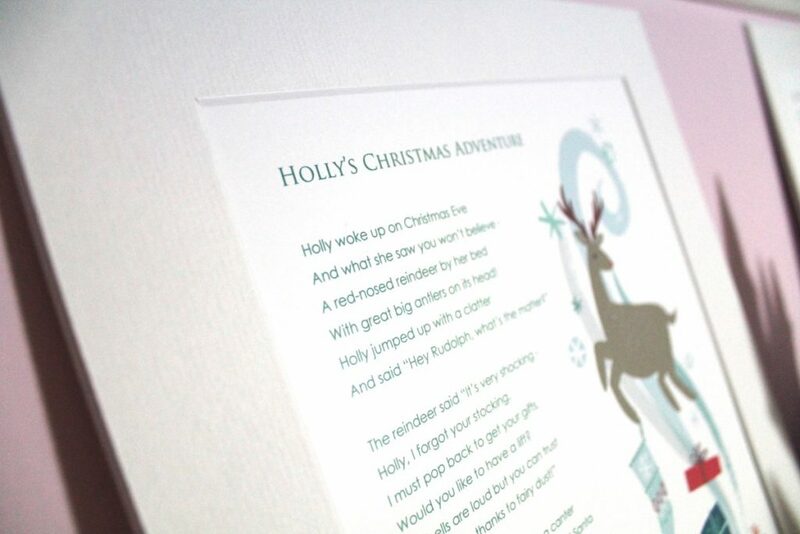 Again the journey is a magical flight through the night sky, where eventually they find Holly’s stocking and return home, just in time for bed, and more importantly, just in time for Christmas morning too! Both are unquestionably beautiful gifts for any child. The Christmas Adventure, clearly more as a Christmas gift, but The Great Big Boo for any occasion you can think of, or even, just because! Personally I think the latter would be a beautiful thought-felt gift for a first birthday or Christening. Both though are tales which are sure to fill their minds with marvel and sheer delight because its themselves in the tale. Just fabulous. I have two very happy little girls. Please note: this post was written in collaboration with Bespoke Verse. I really really love these verses Steoh, absolutely fab. I’d like to try and get some of these done for sure.